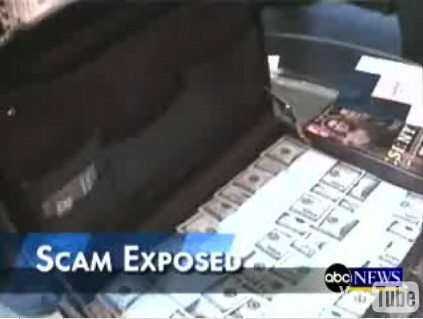 2 Nigerian scammers were caught on video by ABCNews. Apparently, they scammed a heart surgeon by the name of Timothy the amount of US$300,000+, for a luggage of ‘black money’. Timothy was scammed into believing that he can buy a special and expensive chemical to clean away the black coloured dye on some ‘black money’. The usual explanation by scammers is that the money is dyed black to avoid detection by customs. After finding out that he was scammed, Doc called his friend from ABCNews for help. Timothy managed to invite the scammers in for round two, but this time with one of the TV producers and his video crew. Half-way through the Con session, the video crew decided to walk out and expose the scammers… watch the scammer cry. Scammers caught selling replicas and fake electronics! !